The fact I can plug a PCIe card into an ITX board puts ITX in a different league. I have built small servers by adding a second network interface, and built small gaming rigs by adding a graphics card. I take it these won't fit in a uATX case if the situation arises either as the standoff holes will be wrong. ... I take it these won't fit in a uATX case if the situation arises either as the standoff holes will be wrong. mITX already uses the smallest possible subset of mATX mounting holes, so any board smaller than that must use incompatible stand-off positions. So I don't get it. If I don't care about expansion, I probably won't care about whether my CPU is soldered down as well which would lower cost. Wake me up when they make something compatible with my Raspberry Pi case. Do you care about having a case you like the look of? Because right now there's no guarantee that the nicest case is available with the components you want. A motherboard standard like this allows you to pick case, connectivity and processing power separately. Although much like it's Thin-ITX predecessor these appear to be designed for untidy external power bricks instead of a neat internal power supply. Although I couldn't find the specification document to check what it actually makes provision fro. Yes, I care about the case choices I have. I own low profile mITX cases that can't take any meaningful graphics card and that is pretty small though has an sfx psu so could be smaller. I have a CoolerMaster Elite 120 which has had my R9-285 plugged into an mITX board because my needs changed. Here is the real killer, I have plugged an mITX board into a mATX case. It looked a bit lost, but it worked and made it easy to play around with before cramming components into a tiny case. 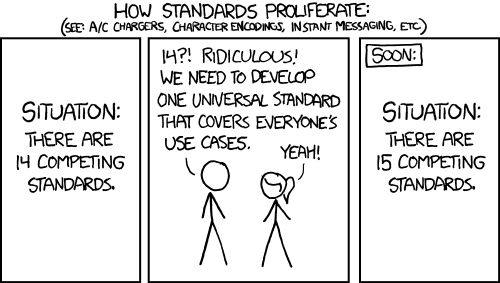 Except none of the 'old standards' ever really became standard. NanoITX and PicoITX, NUC and ThinITX. Mini-ITX is at least double the size of this STX standard, it's not comparable. It was ok as an transition but most MiniPCs have now moved away from it, even gaming ones like the Alienware Alpha and Zotac EN970. As an idea for a platform I can kind of see the appeal (bare with me) for enterprise and SMB. In these environments SFF and USFF systems are quite popular due to space, heat, noise and power requirements being low. Most of the options from well known retailers will almost always include mobile chips that are soldered. This platform would allow you upgradability with minimal sacrifice in size. The problem is that this is an Intel standard and they change the socket with every generation. How likely is it that a customer of this type would upgrade the chip within a single generation? For the common home user this is pointless. If they don't have a PCI slot, why also no Thunderbolt 3/USB 3.1 type "C" port. With one of those the possibilities improve, even to a external video card. I wonder the reaction then when turning up for LAN gaming with a tiny, wee box, a external VGU and 2x external power sources. I agree with DanceswithUnix's cartoon on standards, just look at SATA express ports, have we seen any consumer drives for this - NO. So what was the point of putting it onto every MB? Then they introduce a great new USB port, but forget to put it onto the MBs. AGhhhhhhh. As an idea for a platform I can kind of see the appeal (bare with me) for enterprise and SMB. The problem there is that the enterprise/embedded users want platform stability; the ability to buy identical hardware for the next 5 to 10 years regardless of how technologically backwards it may have become. The idea of upgrading the CPU would be vile to such people. Needs to be a half height graphics card standard so that a card could stand up in a case like this if they added a PCIe slot. If the R9 Nano height was lowered and the length increased a bit, this would be one hell of a tiny computer. Or maybe a top AMD APU would suit this system nicely.